This chunky little trackable was picked up at one of the entrances to North Meadow, the fritillary-strewn area just to the north of Cricklade. Starting in Ilkeston, Derbyshire, in October 2012, it has travelled 2700 miles around the UK, from Tyndrum in Scotland to Camborne in Cornwall. It has a simple mission, to travel from cache to cache. We can manage that! We remarked in this blog recently we were approaching our 1000th cache milestone, and with a venue agreed for this auspicious cache we just needed to bolster our cache total a little bit. (We started the day on 991 caches and felt a target of 7 caches would get us close enough to 1000 that we could achieve the milestone in the pre-planned location). So how to find those 7 caches ? Well, we realised that as we walked (and cached) the Thames Path, there were locations we didn’t explore properly or indeed see at their best. The first of these was North Meadow, Cricklade. (Readers may remember the very wet conditions we endured in January on our first visit to Cricklade). As we noted in our January blog entry – North Meadow is renowned for its Spring Flowers and Snakes Head Fritillaries in particular ( http://www.crickladeinbloom.co.uk/north_meadow.html) and we were treated to a fantastic display on our visit today. 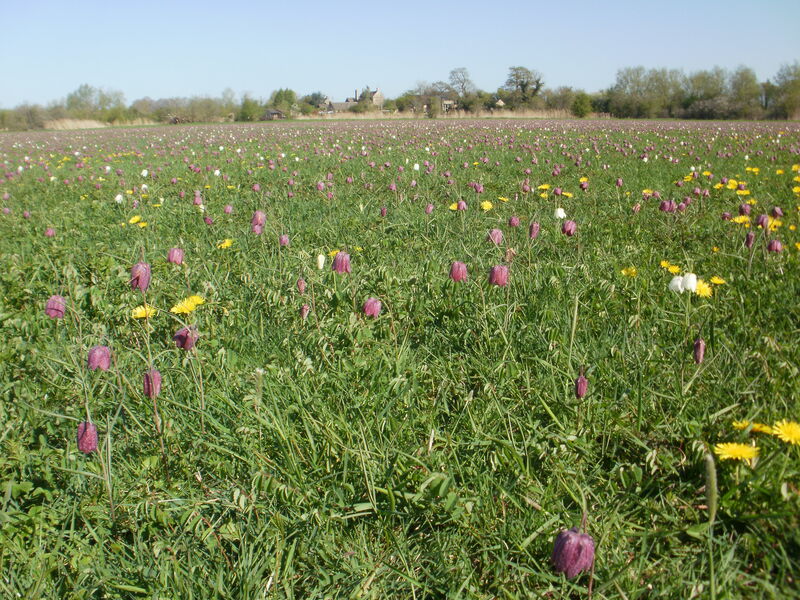 Snakes Head Fritillaries are rare in Britain and 80% of them are in North Meadow, Cricklade. There’s even a cache nearby too! Set by the Scouts it is marked as a ‘multi-stage’ cache. We didn’t find the first part, but did find the cache and a trackable ‘3 Ball’. We’ll take this on our future travels..
We’d arrived shortly after a large coach party, so we decided against going round the house, as they work on a timed-ticket policy and we were in for a long wait! And so to the Kelmscott caches. 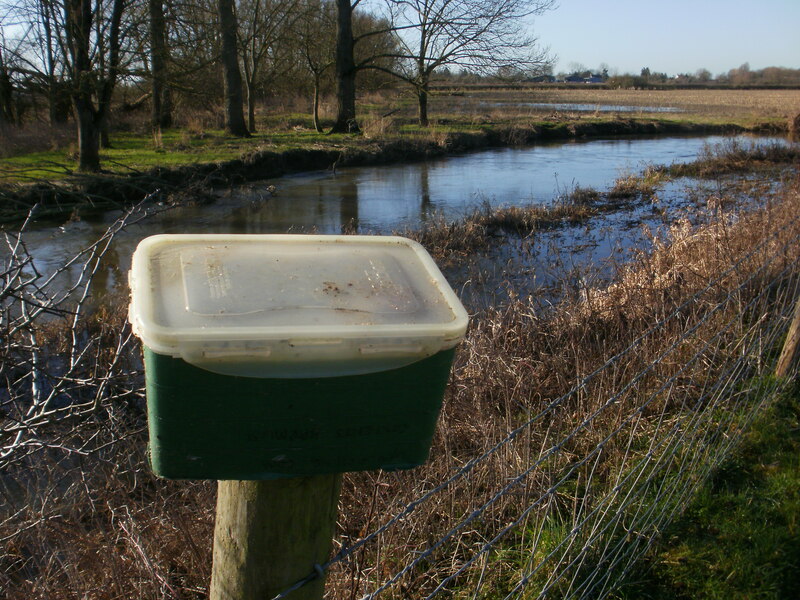 We enjoyed the 3 Kelmscott caches we had found previously and were again pleased with the variety of containers today… including A RAT! After a quick visit to the Church, paying our respects to the Morris clan buried there…. 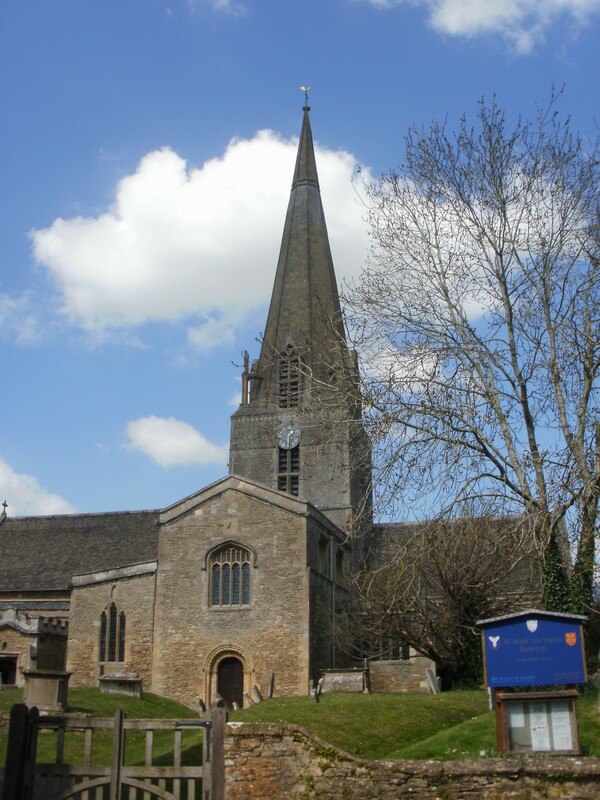 … we left for our third and final location, Bampton. Bampton ? You’ve never heard of it ? But I’m sure you’ve seen it! With 3 caches still to find for the day, we opted for a multi starting at Downton’s / Bampton’s Church and then walking past gardens, fields and woodland before arriving at a small bridge under which the cache was hidden. We sat there, drinking coffee, thinking we were the only people for miles around. How wrong we were ! In the space of 10 minutes at least 3 groups of people squeezed past us, and one dog nearly ate our biscuits too! So our day of tourist activity was complete – Spring Flowers, British social history and TV drama all rolled into the 7 caches we needed to take us to 998 caches, and just a small step from number 1000. If you are reading this blog for the first time, and want to find out how we get on finding our 1000 cache, why not FOLLOW and get the blog sent as an email? As we remarked in our previous post, we found Hopkin the Easter Bunny at Inglesham Church. On the reverse of the ‘geocoin’ is the message ‘Happy Easter’ which given it is currently Lent, is very apt. Hopkin’s mission is to hop from cache to cache searching for chocolate eggs and hunting for furry relatives, Hopkin has had all his inoculations and can travel anywhere to meet the wonderful cachers, creatures and peoples of the world. With his goofy smile, Hopkin also loves having his photo taken too! So where has Hopkin been ? Well since Easter 2012, when Hopkin was released into the wild, he has been to Holland, Germany, Bulgaria and Ibiza hopping a HARE-raising 8600 miles. We could RABBIT on, about the aBUNdance of caches he has visited, but that list may be as long as “WARREN peace”, so we will TAIL it off there. We are HOPing to place it in a nEARby cache soon, FUR others to find. Only a few days after our last walk, we were back on the Thames Path. This time there would be quite a lot of “Path” and not very much “Thames” as this part of the walk is mostly several fields distance away from the river. 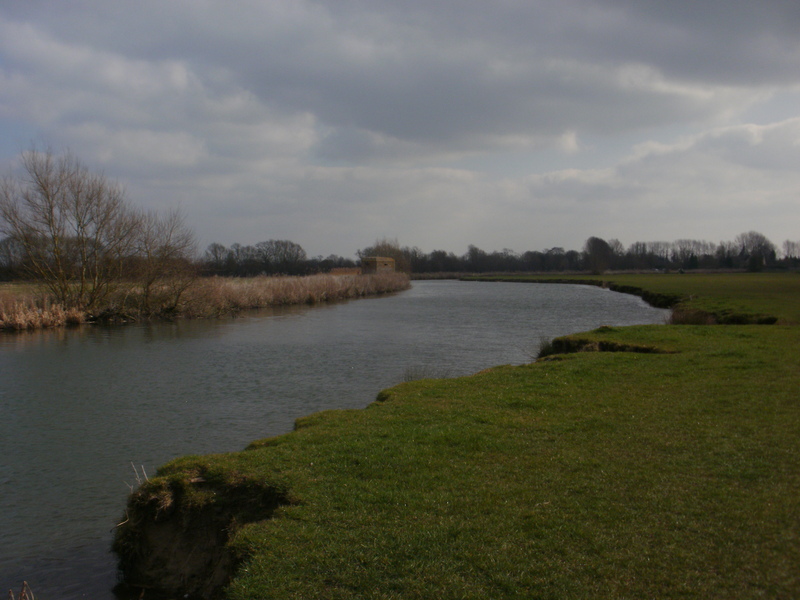 The Thames Rangers are working with local landowners to fix that, but it’s not settled yet. Setting off from the lychgate near Castle Eaton church, the first mile of the walk was along a quiet country lane, with not a single geocache. 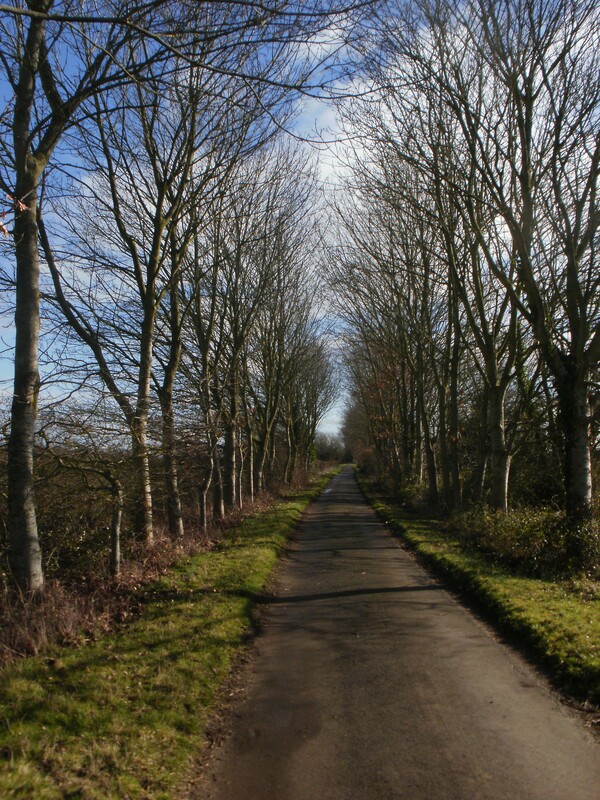 At the end of the lane, the geocaches started, as we had reached the Hannington Wick (HW) circuit. We had already decided to step away from the Thames Path, find some of the caches in the series, then head back to the Path, and then to diverge again a little further on to find the remaining HW caches. The first part of the plan worked well, though it was quite wet and muddy underfoot (was this a portent of things to come?) and we returned to the Thames Path with several caches safely found. Finally we reached the Thames itself, which we last saw before we reached Castle Eaton, and arrived at the site of another cache. But where could it be? Some hedging and tree clearance had taken place and the cache site no longer looked like its description. We searched around unsuccessfully for some while, then paused for refreshment and reflection. Coffee works! Success at last! We found the misplaced cache after a little more searching. For a short distance we followed the main course of the river, then a side channel, and then we doubled back along the a wooded track to complete the HW circuit. 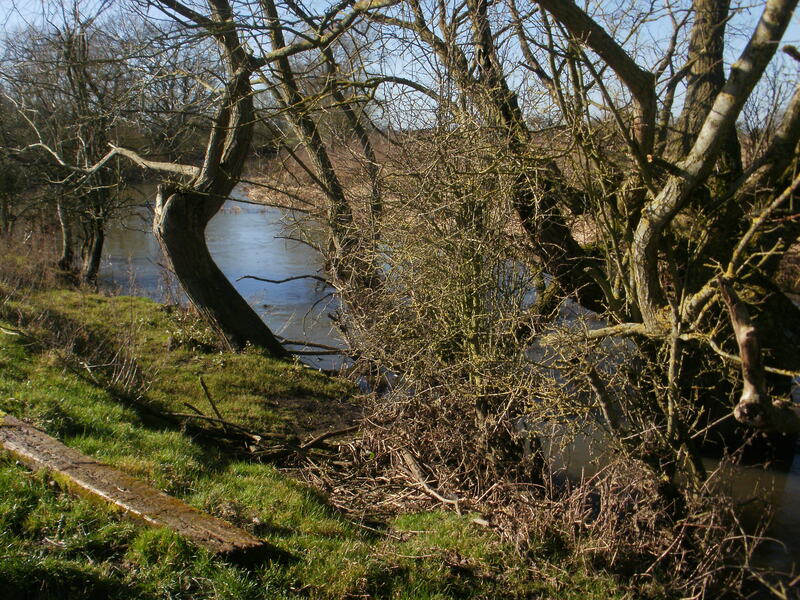 With just one cache left to find in the series, it got damper and damper beneath our feet, and then the track disappeared under some inches of flowing water; oh dear, this was so horribly reminiscent of our freezing paddle through the Cotswold Water Park a month earlier. 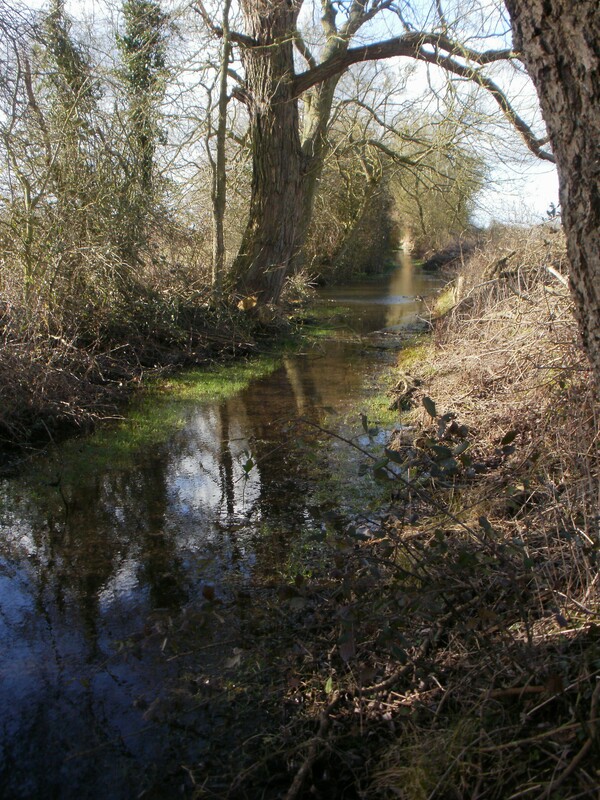 Watery Lane – now I wonder why it got that name? Back on the Thames Path, we collected more caches along an attractive but muddy bridleway leading to Upper Inglesham. We had found 17 caches out of 18 up to now, a good haul, and had one more cache to go. But first: the not so fun part of the walk. To get back to the river, just over a mile of the busy A361 needs to be travelled. The guidebooks strongly advise against walking this section, and suggest a bus or taxi instead. We had decided to walk, though we weren’t looking forward to it at all. After psyching ourselves up, we set off into the traffic. It turned out to be not as bad as we feared, as traffic was fairly light, the weather was dry, and the verges and hedges had been recently cut back, but we were still very glad indeed to step off the main road and head down the quiet, narrow lane to the hamlet of Inglesham. 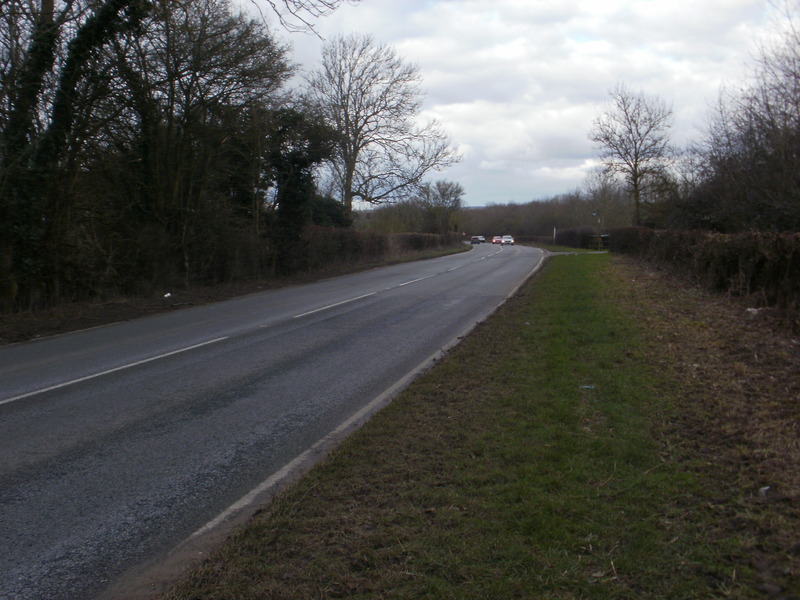 Inglesham is the site of a lost village where only a farm and an 11th century church remain. The church is much as it was five, six, seven hundred years ago and is well, well worth a visit as it is like stepping back in time. 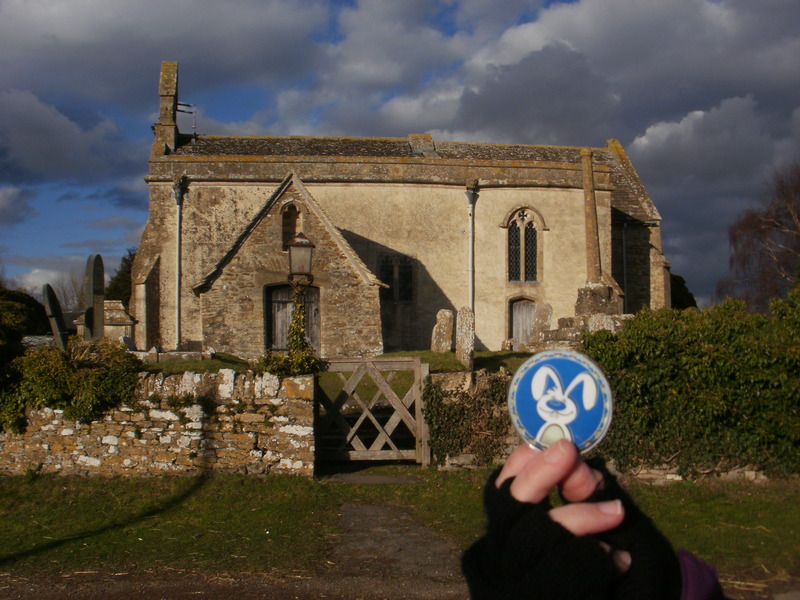 And just outside is a Church Micro, our final cache of the day, where we found another trackable to move on its way – hello to “Hopkin the Bunny”. Finally we got back to the River Thames, which had grown since we saw it briefly a few miles earlier. Across the river was Inglesham Roundhouse, once the lock-keeper’s cottage where the (currently derelict) Thames and Severn Canal ended. And, in the river itself, were … boats! We had reached the head of navigation on the Thames. 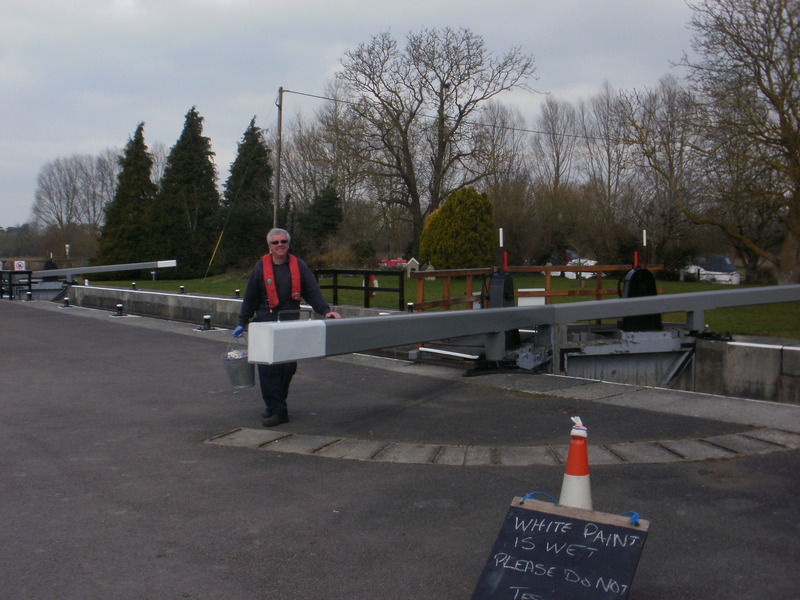 From now on it will be boats, locks, weirs, and more boats all the way to the tidal river at Teddington. The National Trail geocoins have different missions. Some want to travel all of the National Trails, others want to stay on the trail where they were released, or to visit all the counties in the country, etc. This particular coin wants to visit as many trails as possible, and it has so far visited the Ridgeway, Thames Path, and parts of the South West Coast Path. We think we will move it to another location on the Thames Path, but we aren’t sure yet. Back to the Thames Path! 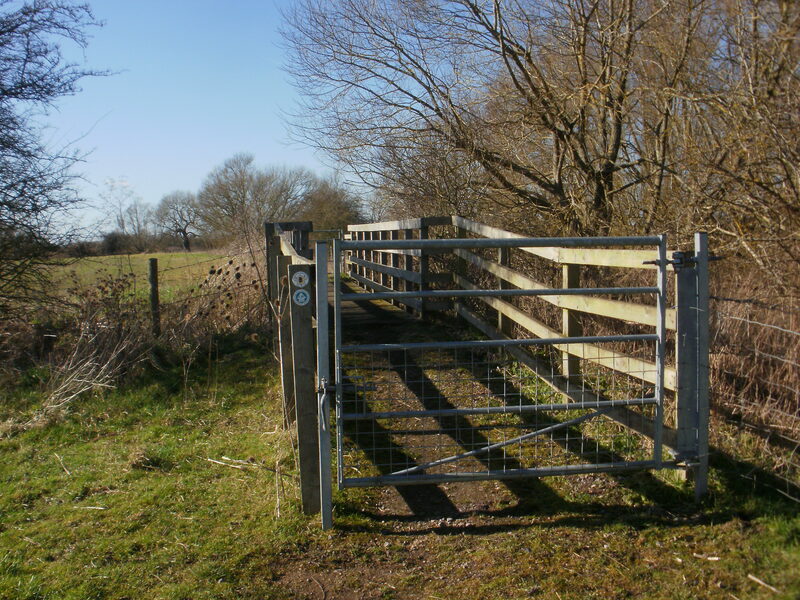 After a few weeks away from our year-long project, we returned to the Thames Path. Various commitments had meant we hadn’t visited, as well waiting for the waterlogged fields and paths to dry out. We have been taking 2 geo-cars on our Thames Path adventure parking one at the destination and the other at the start. 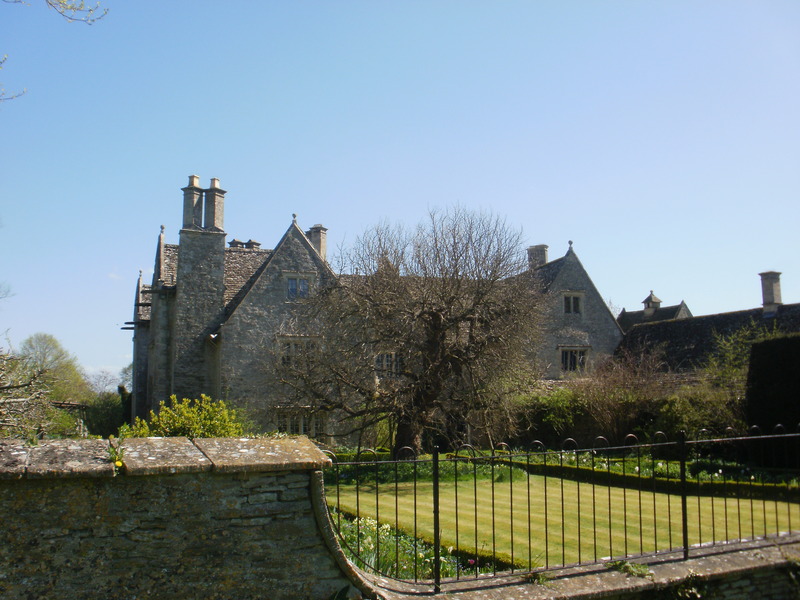 Today we took just one for our short walk between Cricklade and Castle Eaton (about 3.5 miles). 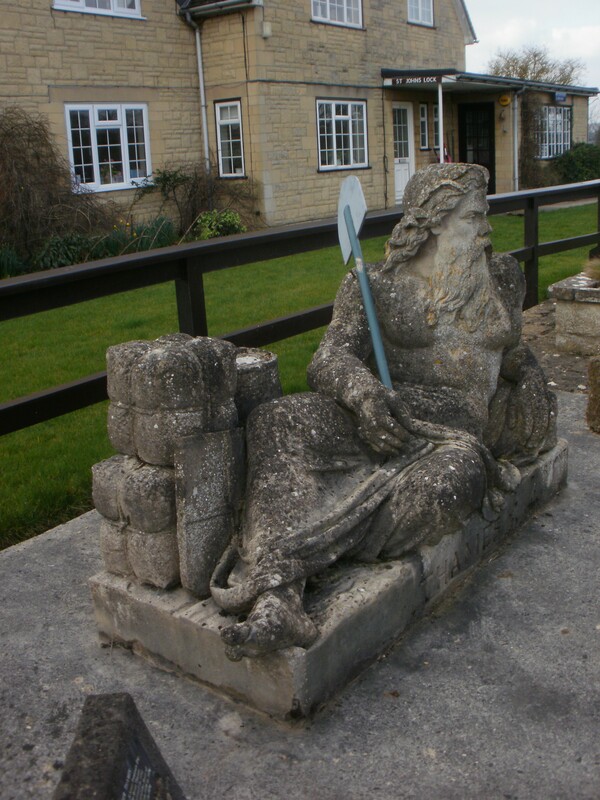 As there are no footpaths connecting the two habitations, we would retrace our steps along the Thames Path to Cricklade. This would give us the added comfort that if we didn’t find any of the caches on the way out, we could re-attempt them on the return leg. Fortunately we found all the caches on our outward journey. 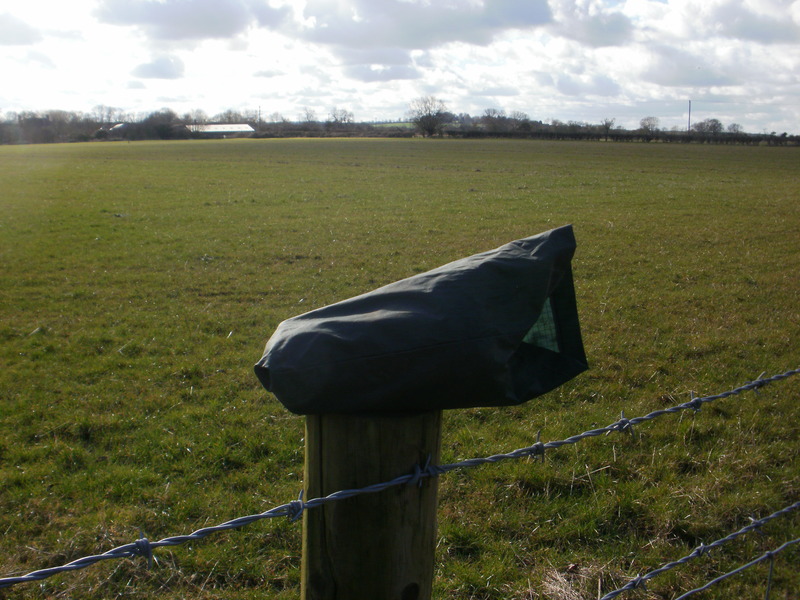 The hides were in a variety of locations from gateposts, to hollow tree-trunks, under bridges, and in one case the other side of a barbed wire fence! As before we have included a small subset (in random order) of these caches at the bottom of the blog. 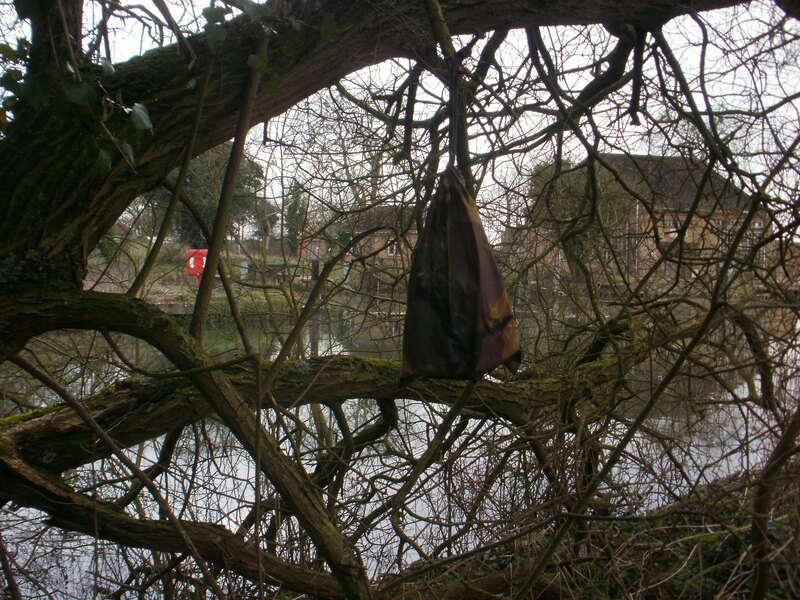 One of the caches contained, as part of its swag, the book “Hideaway” (apt, eh?) which had been left there as part of the book crossing scheme http://www.bookcrossing.com – sort of like geocaching trackables – but for books! The book is a little damp, so we will have to dry it out before we move it on. We meticulously followed the many meanders, crossing footbridges and admiring the many reeds which formed the river banks. Eventually we arrived in the small village of Castle Eaton, and visited St Mary’s church, where tucked behind the graveyard the Thames banks were covered with snowdrops and daffodils.